I hope your skies are clear, the air is warm and there's an abundance of trails to explore wherever you are. Here in my neck of the woods we have clear skies and warm air, but finding good trails to run requires some travel. I really envy you guys who live in or near the desert, mountains or open trail forests/backcountry. So much public land is being denied to off roaders all over the country here in the USA. This makes my blood boil because of a few politicians, environmentalists and government regulatory agengies that are trying to make off roading the equivalent of dumping chemical waste into our water supplies. With the exception of a few rowdy mudslingers the vast majority of Jeep and 4x4 off road enthusiasts have great respect for the land. The ecosystem is also a lot more resilient than for which it is given credit. There are many more state and local organizations as well as Jeep and off road clubs that advocate for our sport as well. Look for one in your area. 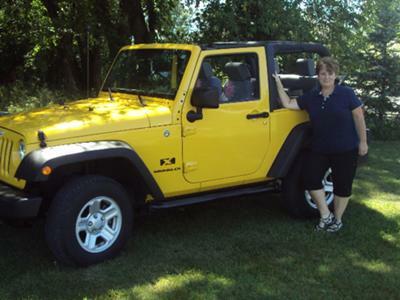 This month's Jeep Readers of the Month photos is dedicated to all of the Jeep Girls out there. 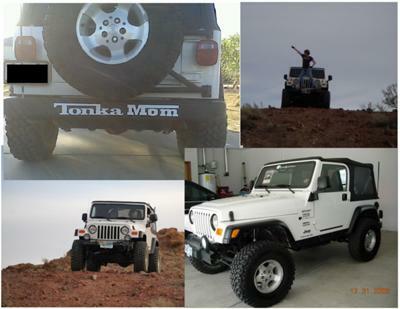 I receive a good number of Jeep photos and stories submitted by ladies who love these icons as much as the guys do. ...Time to Change out your Driveshaft U-joints? My 1995 YJ is getting a partial underbelly overhaul at the moment. 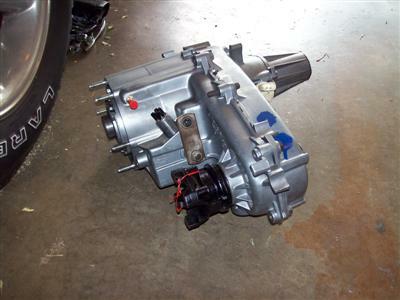 I have replaced the transfer case with a brand new one. I will be adding a new catalytic converter and muffler in the next few days, however while I had the t-case, cat converter and muffler out I decided to change out the front and rear driveshaft u-joints. These u-joints appeared to be the original parts which would make them about 16 years old. Anyway, if you have never done a u-joint replacement before then you should get some good instruction first, or have a professional do the work for you. I needed a refresher myself so I found some video instructions online. Even so when I was putting the first new u-joint on the rear driveshaft, I dropped the end cap (yeah...with all of the little roller bearings) spreading the bearings all over the garage floor. You see, the needle bearings are only held in place in the end caps by a glob of grease. So, if rattled or dropped before they are seated on the u-joint body...you have a problem. You can pick up all of the many needle bearings (if you can find all of them) and clean them and the inside of the end cap thoroughly...then carefully replace each bearing followed a new glob of grease. 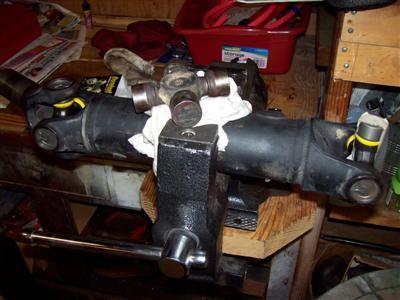 Or, you can do what I did and take the messed up u-joint back to the parts store and throw yourself on their mercy. I guess I looked pitiful enough because they gave me a new u-joint with no questions asked. Yea! Needless to say I didn't make that mistake again. I got them all in (there are 2 u-joints per driveshaft) and now I feel good about having the new u-joints spinning with the shafts instead of waiting for the old ones to give out. The bottom line is that if your u-joints have not been changed out in quite awhile, or your Jeep has been run hard and put up wet too many times, you might want to consider this replacement. Jeep Trivia: Jeep introduced the first automatic transmission in a 4-wheel drive vehicle in 1962 in its Wagoneer. So, until next time remember this...the paint on your Jeep is just there to mark your territory! Get your Jeep's repair manual or a fun Jeep book...the cheapest Jeep book deals are at Jeep Books Plus. ***P.S. Don't forget to get your Jeep photo and story...new, used, beater, project or in any other condition...on the Love of Jeeps website by submitting yours here: Your Jeep Page...and I will consider it for the website. Let me know what you think about anything Jeep related by contacting me anytime. 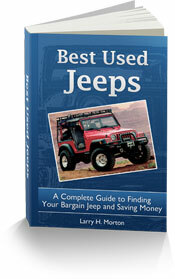 Simple to Download Ebook Covers Nearly Every Jeep Found In The Used Marketplace. 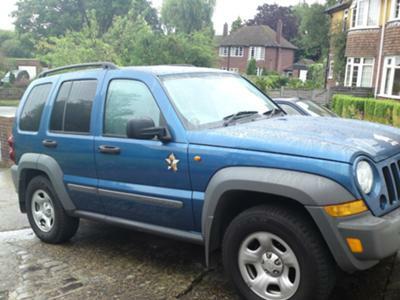 The Easy To Follow Guide Will Give You The Ability To Know The Differences, Good and Bad, Between Jeeps of Almost Every Model and Year. No Bull Solid Info For Jeep 'newbies' And 'veterans' Alike! 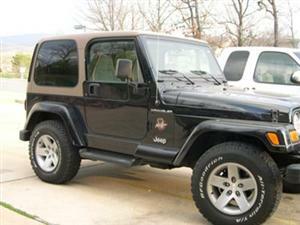 Best Used Jeeps Guide...More Info! Times are tough. Build a business the right way online. This is the real thing.